Here are the pads that I tested out. 1 Mini Pantyliner (red), 1 Maxi Pad (blue w/mushrooms) with 1 Maxi Basic Liner (blue) and 1 Maxi Wing Liner (blue). The Maxi Pad- This is great for light to average flow. It measures about 9.75" long and 6.75" from wing to wing, after washing. These are made with three layers, pictured below. The top is two layers of cotton fleece, which is soft and absorbent. The middle is one layer of nylon, which is water resistant. The bottom, with the wings, consists of two layers of cotton flannel. There are metal snaps made of silver plated brass(nickle-free) that are attached to the wings. 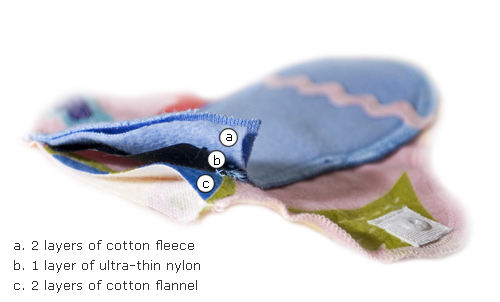 The Maxi Liners (basic and wing) are two layers of cotton fleece. With a base and liner you have the option of purchasing organic cotton for $3 more. The Mini Pantyliner- This is perfect for light days or with a menstrual cup. It would be great to use during pregnancy too! It measures about 7.75" long and about 6.5" from wing to wing, after washing. They are made of two layers. The top is cotton fleece. The bottom, with the wings, is made of cotton flannel. There are metal snaps made of silver plated brass(nickle-free) that are attached to the wings. You have the option of purchasing organic cotton for $2 more. These wash and dry really well. I find I have little to no staining when I soak the used pads in cold water until the end of my cycle. Just a tip: Make sure to refill with clean water each day. You can even add a bit of vinegar. Then throw them all in with a load of clothes. I like to use a mesh bag so they are easy to find. Just like with cloth diapers you want to be sure to use natural gently detergent and no fabric softener. Usually cotton items need several washes to reach maximum absorbency. I noticed these were quite absorbent after just a couple washes. Maxi Pad. I ♥ the mushroom fabric even though it isn't organic cotton. Everything fits nicely in this travel pouch. I love natural cotton. It is so soft and breathable. No more sticky feeling. The maxi pad works wonderfully without leaks and does not slid around. With the mini pantyliner I almost forget I am wearing anything. It is great for light days and added protection with my diva cup! These are both so trim. It's great that these are made in Canada! I wouldn't change the design on any of these products. I would love to see more patterns in organic cotton though. I would also love if the top layer of cotton fleece had a cute pattern instead of a solid color. It would help to hid the stains better! Wearing washable pads gives you such a great feeling. Not only is it more comfortable, it is better for your body, the environment and not to mention your pockets! Plus, you can have cute colorful pads that you can match with your undies. These are very well put together and will last years to come. Once you try these, you wont ever want to go back to bleached white plastic. Get your own sampler pack for only $28.65. Use the code BLOG15 for 15% off orders over $35. It expires August 31, 2012. Sign up for their newsletter and receive a $5 off coupon too! Come back for the Summer Celebration Giveaway Hop, June 21-29, to enter to win a $50 gift card for Lunapads! Open to the US & CAN.